The time has finally come. You thought it might never get here. But, after all of your hard work and long days, you’re finally ready to introduce your new (or newly renovated) laundry business to the world. You’ll need to decide which grand opening ideas are best suited to your particular operation and marketplace in order to raise maximum awareness. Yes, planning a grand opening is exciting, but to reap the benefits, you must be clear about what you want to achieve when hosting your opening event. Advertising the event. This not only lets people know that there is an event happening but also that there is a new laundromat that is open for business. Be sure all of the equipment is working. The old adage – “You never get a second chance to make a first impression” – is very true here. Customers are coming to your store for the first time with a critical eye – trying out the equipment to see how it works, examining the store’s cleanliness and so on. Doing laundry should be as seamless and easy as possible for customers. An initial impression of the equipment not working is the ultimate bad first impression. Make the customers feel welcomed. You want your vended laundry to be a welcoming addition to the community. Some businesses have established the practice of welcoming customers as they walk through the door. In most cases, this immediately lets individuals know that there is staff there to greet them and provide help if needed. It’s always nice to be personally greeted when you arrive. Engage with the customers. Nothing beats a personal conversation with the customers to explain the services that the laundromat offers. Give people a reason to return. Sometimes customers are not bringing their laundry and are just “scoping the place out.” Be sure to have an action plan for customer interactions, encouraging them to return when they are ready to do laundry. The most obvious method is a coupon for the customer to take with them. Utilize the grand opening opportunity to collect email addresses from potential customers so that you can stay in touch with them in the future. If you are giving away promotional items, this is a perfect time to get those email addresses in exchange for the gifts they are receiving. If you have a laundry card system, be sure to have an ample amount of cards available to give out to your customers. If your card system involves a registration process, encourage customers to register their cards on the spot. Of course, a prize or special offer will help to entice them. Also, make certain to have flyers or business cards that include your name, street address, website and a special offer. This way customers have a take-away to remind them to revisit. Create a bigger event with more visibility, as well as the potential for music and even dancing. Entertainment is an important part of the grand opening for several reasons. For one, it gives the customers a reason to stay at the event for a period of time, instead of a quick walk-through. This allows you to have more time to engage with the customers and ensure that they understand the services that are provided. It also creates an atmosphere of fun and excitement. Entertainment allows people to experience something that traditionally is not associated with laundromats, which is having fun. The sheer novelty of this can provide a memorable experience that customers may want to share. Everyone loves free food, and there are easy and fairly inexpensive ways to provide this at your grand opening event. 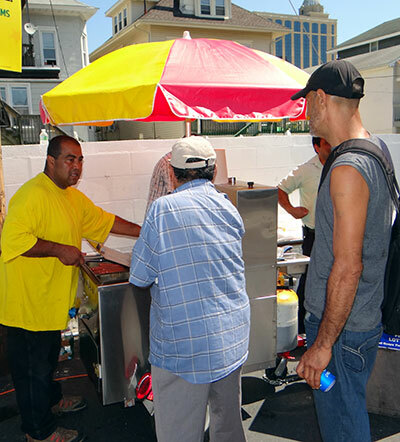 Renting a hot dog roller, a popcorn machine or a snow cone machine is an easy, portable and self-contained food provider with inexpensive raw materials. In addition, food concessions like this help to provide a carnival-like atmosphere, which helps build excitement. Music is another great way to generate excitement and also to advertise on the day of the event. If you think of a grand opening as a party, music is a must-have. Have the music outside, since music inside the building can be perceived as annoying, and people are drawn to music that they hear in the distance. Also, an audience can be generated organically with people curious to know what is happening. Local DJ talent or radio stations can be tapped to provide music and can help draw people on their own accord. Don’t forget to have something for the kids. Whether it’s a bounce house, a face-painting artist or someone making balloon animals, kids’ activities are important to draw in families – one of the most important and profitable customers for a self-service laundry. Let the public know that kids are more than welcome in your new establishment. People love free stuff. Personalized promotional items are a great offering. Laundry bags that are personalized with your laundry’s address and website are a great idea, providing a constant reminder of where laundry can be done. Refrigerator magnets, chip clips or sticky notes provide an object that can keep advertising even after it’s brought home. Also, coupons for a free wash and/or dry can help to drive customers to your laundry for a future visit, especially if your customers don’t have laundry to do on the day of the grand opening event. Above all, be sure to have a full staff on hand with a clear script to engage with the customers. “Free is absolutely the strongest word in marketing,” said Karl Hinrichs of HK Laundry, headquartered in Armonk, N.Y. “There is nothing better than ‘free.’ Free money on a laundry card. Free drying. Even 10 pounds of wash-dry-fold for free with a 20-pound order. Just make sure that the perceived value of the giveaway is large enough to get people to break their old washing habits. If it’s not a large enough incentive – such as free soap, for example – then you won’t get people in the door. Bean instructs his laundry-owner customers to promote this event through a mailing of about 5,000 to 10,000 postcards, scheduled to hit mailboxes during the week just before the grand opening event. “We never don’t do this promotion, and it’s never failed once,” Bean said. “Some laundry owners will want to offer just free dry or hold the event just on a Saturday. No! You can’t put limitations on it. You can’t make your customers work too hard. “Yes, some will bring in other people’s laundry,” he added. “Some will exploit the offer. But you’ve got to put it out of your mind. You’ve got to forget about it. Don’t get emotionally involved. Just have a glass of wine and get over it. You’re going to be fine. I know you’re giving things away, but just pull yourself together. Flyers and doorknob hangers are a good way to announce your grand opening event to the public. Other local businesses also could provide flyer space or a place to leave a stack of smaller flyers. Contact your Chamber of Commerce for help and ideas. Enlisting the help of advertising in local newspapers or radio stations are other ways to get the word out. Don’t neglect social media as a vehicle for promoting your grand opening. A grand opening event should be held on the busiest day for the laundry, in almost every case that’s a Saturday or Sunday. These are the days when most people are available to attend and are out and about looking for something to do. Obviously, avoid holiday weekends, as many people likely already have family plans during those times. “Once the store gets its certificate of occupancy, the laundry can open its doors and start making money,” Hinrichs said. “The time between this soft opening and the grand opening event is the time to get all of the laundromat’s systems in place, to properly train the attendants, and to get everyone comfortable with their new roles and understanding the new machines. The time period between the soft opening and the grand opening is a critical time for the laundry operator to identify and fix any unforeseen operational issues. “We encourage laundry operators to be on-site during this time period, carefully observing their customers and the operation,” Kane said. “What are the most common questions the customers ask? Is there a way to preemptively answer these questions with signage or a brief introduction of the process by an attendant? Try the equipment yourself in an end-to-end process of ‘doing the laundry.’ Try to determine the pain points now and solve those issues. To make sure that customers can find your laundry, search for your business – and your competition – via online searches and tools. Coin drops – Be sure every single coin drop works, and that the coins drop into the box and are registering correctly. Multiple machines – Start all of the washers at one time to make sure that water supply/drain can handle all filling/draining at one time. Start all of the dryers to be certain that you don’t have makeup air/venting issues and that they all heat correctly. Cash/Change machines – Thoroughly test these units so that you’re confident they are working properly. Although it should go without saying, be sure that your store is immaculate during this critical time period. Being clean is one of the most important factors to a vended laundry’s overall success. Of course, it’s crucial to include grand opening expenses in your operating budget right from the beginning. Clearly, the costs for such an event will vary greatly. However, somewhere between $1,000 and $10,000 is probably in the ballpark for most vended laundry openings. “I would suggest a grand opening budget of no less than $5,000 – which, as a percentage of the total cost to build and equip the new store – will most likely be less than 2 percent of the total project cost,” said Russ Arbuckle of Wholesale Commercial Laundry Equipment SE in Southside, Ala. “Free wash weekends, although they sound expensive, really aren’t. In addition, you don’t have to pay for the promotion until you get the water, sewer, gas and electric bills. If planned correctly, this could be as much as 30 days after the grand opening event. “It’s relatively easy to come up with a budget number by taking the projected weekly revenues from your pro forma or business plan, multiplying by 0.8 – assuming your weekend will generate 80 percent of your weekly revenue, and then multiplying that figure by 0.2, to represent a 20 percent utility versus gross revenue ratio. The resulting figure will be a very conservative estimate to your actual costs for the water, sewer, gas and electricity – especially considering the natural gas portion will be only for the hot water used, and the electric figure will be only for the electrical consumption of the washers. “This is an important event, so make sure not to be penny-wise and pound-foolish,” Miller stated. Of course, be sure to have enough knowledgeable help on hand to manage the wave of people flooding your store. Our first laundry is located in a strip center with a Mexican restaurant across the parking lot, so we partnered with them to open their taco stand. We issued tickets good for one free taco, and we also had cakes from Costco. For our second store, we created more of a cocktail party vibe with wine and finger food. As far as promotional giveaways, we gave away kids’ bikes, laundry detergent, laundry bags and laundry cards at our first grand opening. For the second laundromat, we have a younger and different type of clientele, so we gave out televisions and iPads, as well as laundry bags and laundry cards. We also hung posters and posted to our social media for a few weeks leading up to the event. We had been open for a couple of months before we held the grand opening events. Key Considerations: Don’t dismiss the business community around you. Partner with other local businesses when possible. They may want to be a part of your event – and perhaps even help defray some of the costs. For our grand opening promotion in 2015, we offered two weeks of free wash. At the beginning of the second week, we held a ribbon-cutting ceremony with officials from the Chamber of Commerce attending. I’m a huge BBQ buff, so I made a few trays of pulled pork and corn bread, with all the fixins. We also held drawings for free wash-dry-fold services. As far as promoting the event, we advertised in our local newspaper, which also wrote an article about the new store that ended up on the front page. We ran several Facebook promotions and posted a road sign just outside the shopping plaza. In addition, the Chamber of Commerce promoted our ribbon-cutting ceremony. Budget: Approximately $1,000 in cash and $6,000 in free washes. During those two weeks, we gave out 1,361 washes. The free washes were strictly for cold water and on the shortest cycle. We charged extra for warm and hot water, as well as cycle modifiers. Key Considerations: Go big and make a great first impression. Give your community something to talk about by giving back right from the beginning. We held a free raffle for anyone who visited on the day of our grand opening event. To qualify, they simply had to leave us their name, email address and phone number. We then added them to our email marketing list. The raffle prizes were laundry gift cards worth $75 and $50. We had more than 50 entries. The food at our event included breakfast soufflés (12 of them cut into quarters) and coffee from Panera, as well as assorted granola bars, muffins, donuts, cookies and miscellaneous snacks that we already had in stock for our new vending machines. To promote the grand opening, we ran short TV commercials for a month leading up to the event. The television spots focused on the store’s features and on the upcoming grand opening. In addition, on the day of the grand opening, we used the same TV station to hold a live, early-morning broadcast to announce our laundry’s event. They promoted the laundromat, the raffle and all of the food being served. And, in our favor, there was a “severe weather watch” that day, so we had a larger than normal viewing audience watching the morning news. All in all, it was a huge success for our business. We still have people talking about it six months later. Key Considerations: Attract people to you with food and quality incentives. You have to spend money to make money. Show off the great new features of your store in a no-pressure environment. For the grand openings we’ve held over the years, we’ve tried to enlist a local DJ for music during the event. It puts people at ease and in a better mood than normal. We also appeal to the most powerful sense – taste. We have a large grill with burgers and hotdogs, and a neighboring tenant who provides trays of wings. Cotton candy is good for the cooler months, and we’ve had snow cones during the summer. We offer small-sized waters and sodas to minimize any waste. A bounce house is a reasonable attraction for the kids at a low price, and it’s very visible. Along with the food, we give away balloons and laundry bags. However, the biggest hit are free washes for part or all of the day. Our experience has proved that this will draw more people to your store than anything else. Of course, it also will be the most expensive promotion as well. Then again, a plausible justification is to consider what you will spend for ads or coupons for the two-week period. For that rather large expense, wouldn’t it be better to give it directly to the customer than to donate it to the media or cyberspace, never knowing if anyone will see what you’ve paid for? We promote our grand openings through small local newspapers, social media and signage at the location. A Facebook page for the new store is invaluable, and you can promote the ad on Facebook for a small amount of money, reaching a larger audience. Budget: We spend between $1,000 and $2,000 for the opening of a 4,000- to 6,000-square-foot store. The idea is to bring as many people into the store as quickly as possible. If you do it in a slight manner, you will get a commensurate response. Key Considerations: I would suggest to anyone considering a grand opening event to spend a few dollars and get the word out a much as possible. But then you need to deliver. Having a paltry amount of food or not enough people on staff to help your new customers will only annoy those in attendance and show your business in a bad light. And, although it seems obvious, it’s extremely important to have the owner on site to greet people as they arrive. If it’s a large store, have a few principles available who know the operations. For real “street cred,” grab a spatula and serve up a few burgers. You will gain more respect and truly meet your new customers by serving them directly. • Free wash for seven to 10 days. That really gets people’s attention. When you have a card-operated store, this becomes easy to do. • Radio remote broadcast. I’m not sure how many extra people it brings in, but it generates a buzz and creates more of that “wow factor.” The package sold by our local radio station includes a certain number of spots, which we spread out over four or five days preceding the event. • We set up a huge “washing machine” for the kids to play in – complete with a bubble machine, water misters and oversized quarters for the kids to drop into an oversized coin slot to gain access. • We send direct-mail pieces to residents within our trade area, which are sent out before and after the event. The postcards mailed out after the event include a generous coupon. Our postcards are in English and Spanish, so be sure to print your cards in whatever happens to be the primary tongue of your trade area. We’ll also have coupons on our website. • At different times, we’ve given away balloons, pendants, bikes and T-shirts. We’ve also set up a “reading corner,” which is manned by volunteers who read and color with the kids. I don’t always do all of these at every grand opening event, but I usually do some of them. Key Considerations: At our events, we don’t have a huge crowd inside the store because we try to regulate the flow of people. In fact, we’ve discovered that we actually serve more customers when we have a registration table outside the laundry, and then we tell people when they can go inside. The most important factor is your first impression on the community. First and foremost, open up for a few weeks and work out the kinks before your grand opening event. I learned this lesson the hard way. Years ago, I was so anxious to get customers into a new store that I didn’t give myself enough time to test everything out before the grand opening. Don’t do that! On the day of the event, be sure of offer plenty of entertainment and activities. This can include bounce houses, snow cone trucks, balloons, music, games, book giveaways and volunteers reading to the kids. And food – a lot of food. We typically hold cash drawings and have given away larger items like flat-screen televisions. Also, offering free washing and drying for 10 hours on a Saturday has worked well, when marketed properly. To advertise our events, we’ve utilized the local newspaper, Facebook, flyers and a large banner at the store one week before the big day. Of course, word of mouth is very effective. Budget: $1,500 to $5,000, depending on size of the store and projections. It is important to understand that you’re not in this business for the short term – so budget appropriately for this event. Key Considerations: Allocate 25 percent of your budget toward marketing the event, and put 75 percent toward following through with the campaign/grand opening promise. Of course, have staff on hand to help with this day. Also, enlist your spouse, kids and anyone else who is good with people and has a winning attitude. After the warm and fuzzy feelings of the event, don’t forget to maintain the same level of service throughout the years. In our industry, it’s not so much what you do, but the attitude you do it with. Don’t let your grand opening be the first and last event your laundry ever hosts. Regularly plan events or specials to keep your customers and the local community engaged. Copyright 2007-2019 Equipment Marketers. Site content may not be reprinted or reproduced without written permission from the publisher. Please contact the site administrator with any requests or problems. Whirlpool Corporation has granted Equipment Marketers permission to use trademarks and copyrighted material for limited purposes.